While I was at the club the other night sorting out my Heartstrings with the framing guy one of the other members approached me. He asked about my stitching and then asked me if I would take on this special commission. This is a piece his wife had been stitching before she passed away and he has asked me would I finish it. 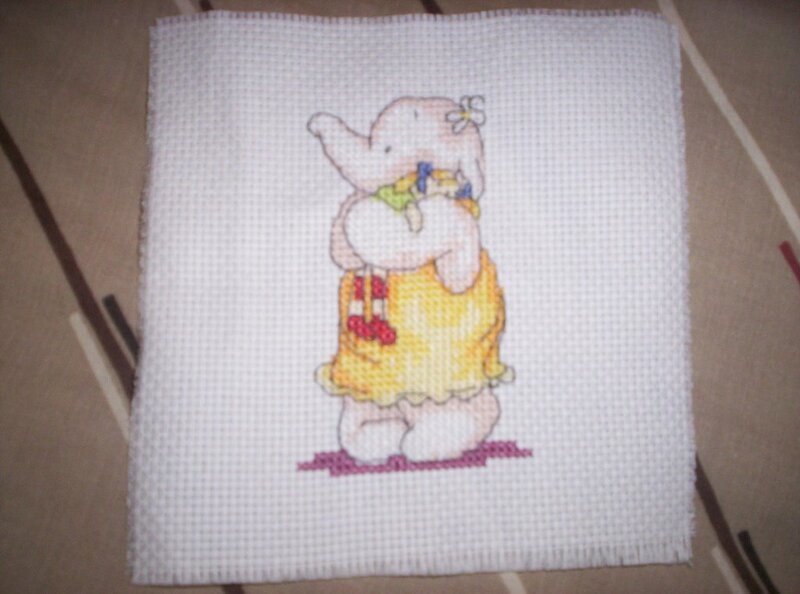 It's embroidery rather than cross stitch but only needs a small amount finishing on it. He also gave me a bag with boxes full of old threads and 2 small hoops. Well of course I said yes. It's quite pretty. I'm gonna sort out the thread and wind it all on bobbins when I get the chance and finish this up for him. It shouldn't take me more than an evening. The stitching that is not the sorting threads. I feel quite honoured to be asked to do this. I finished my Lottie & Lulu Dolly this weekend. Yay! 2 down, 8 to go. I don't usually do small things like this so it's been a nice change. I've actually enjoyed having something small to put in my handbag for bus journeys. 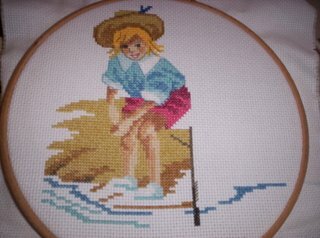 I also did some backstitching on my Seaside Boy. I would've got more done but I fell asleep. I must've been tired because I don't normally nap during the day! You can't see very clearly but I did around his hat, face and shirt. 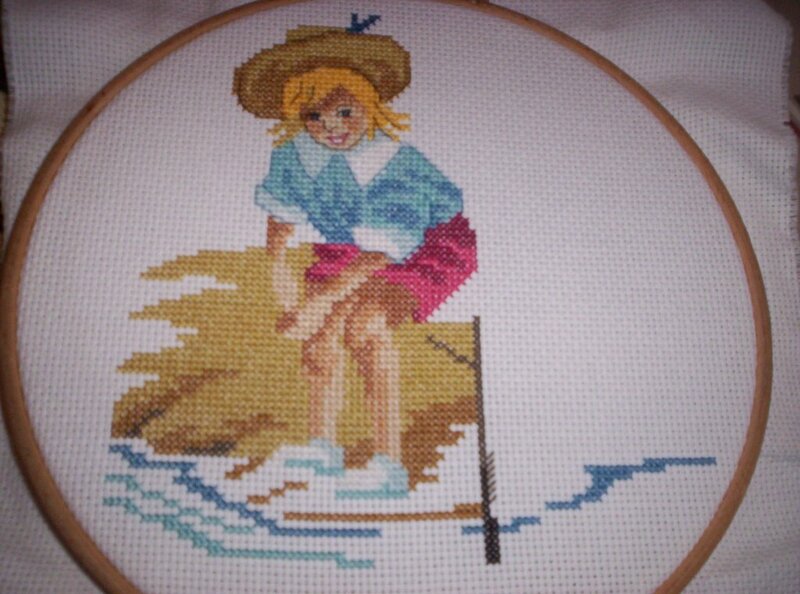 I've decided I'm gonna kit up and start my project for my Secret Stitcher tonight so I can take it into work with me. I'm working 10 hours or more every day this week so I'll be entitled to lots of breaks. Well, 3 breaks. I may as well make use of them and get some stitching done. I'm not gonna be getting much done otherwise. I don't want to take my Feathers & Friends into work as it's quite big so I'll carry on working on that at home. Oh, and I need to find a pattern to stitch a square for a RAK. Lots to do and now I've got a job not enough time to do it all LOL!! Well it's been a busy week! I finally finished the first part of my Heartstrings project. YAY!! 1 down, 9 to go for my project challenge. I don't have a finished picture cos I finished it on the bus on the way to getting it framed. I should have it back on Saturday so I'll take a picture then. I was so glad to finish it! I picked out the pattern thinking it wouldn't take that long but it's taken ages. Now I just need to finish the second one and get that framed. 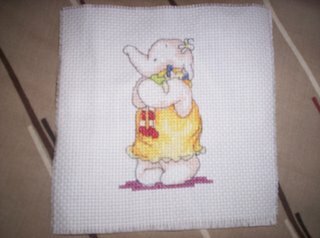 I put Lottie & Lulu Dolly to one side and decided to stitch it on aida instead. So far I've got about three quarters of it done so I will probably finish it this weekend. I'm going to keep all my Humphrey's corner pieces unframed. Then when I've got quite a few done I'm gonna make them into a big wall hanging instead of having loads of them in frames. I signed up for the Secret Stitcher on my group so I've been busy hunting down info and deciding what stash to buy. I also got a load of really good cross stitch books from the library yesterday and have picked out quite a few projects I want to do. One book is all Native American stuff and so I've written up lists of what I need to get for 3 pieces, all for Craig's bestmate. I really like them myself but I wouldn't know what to do or where to put them in my house so at least this way I get to stitch them and they go to a good home. I MUST finish my 10 project challenge first though!! Next on my hitlist after Lottie is Feathers & Friends. 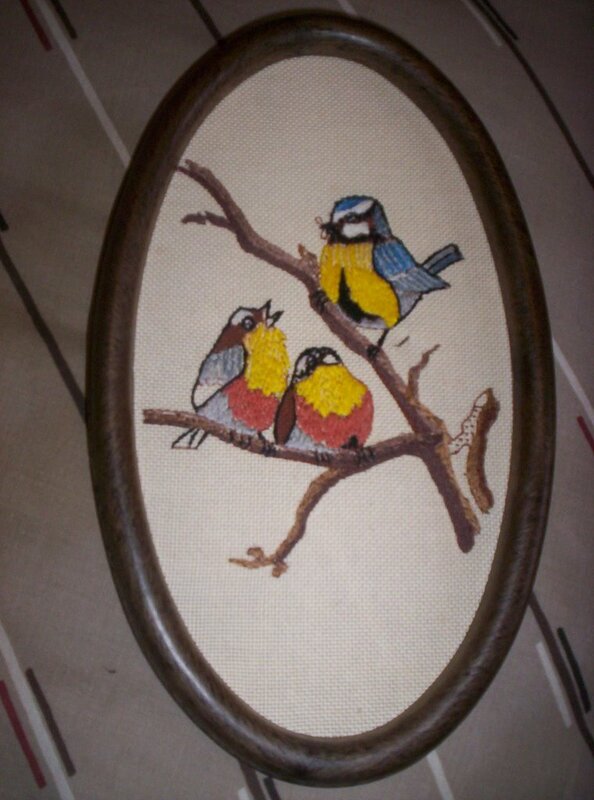 I also need to get cracking on the Forget-me-not Tablecloth and L&L The Wedding. Which reminds me...I bought some hook and loop tape this week so I'm gonna try using that on my L&L to attach it to my scroll frame. Hopefully it'll work! Craig has had his shifts changed too so he now works 1:30pm 'til 9:30pm and 12am - 7pm on Fridays. He's not very happy at the minute because he's sieving all day and he's working with some really annoying guy. Things are slowly coming together for the wedding though I still haven't finished the invites. I worked on them and the place cards all the beginning of the week and then got fed up. I just have the reply cards and some small envelopes to print and they're finished. I made 50 place cards so there should be plenty. Anyway, I think that's all the latest bits and pieces. I better move myself and go shopping or we'll be starving this week! I'm so excited!! I finally got a job. It's only part time but it's better than sitting round the house all day. I went for an interview for a new Primark store that's opening in town quite a few weeks ago now. I was there 3 1/2 hours by the time I got through the group interview to the individual interview. I got a letter last week saying there were no jobs available for my skills and experience then today I get a phone call to say a job had come free!!! It's 2-6pm Monday to Friday so 20 hours in all. I don't have to get up early in the mornings and I still have my evenings free! Oh I'm so happy!! For now I am going to work 2 jobs and keep my part time job on the weekend but I will have to see how that goes financially. It might not be worth it cos of the amount of tax deducted. I can't wait to tell Craig when he gets home! My wages will be going straight into our savings to pay for the wedding. So excited!!! !